Update 29.06.2018: changed the title and description because I'm still not happy with my theory and keep changing it. "I felt it won't be easy... Now I see it's really not! But there is no other choice. He must serve the Pridelands and protect them!" Duchess Zuri watches how General Kion leaves for his evening patrol. I think both of the girls are cute and both of them look nice with Kion. I ship Zuri and Kion, and your art is great. Oh, that's nice! And thank you! I find it very interesting that you are giving them human titles. 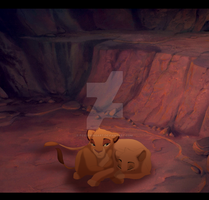 I don't know why but I've just never seen the word duchess in the Lion King so it stands out when you use it. I just thought there should be some other titles at least in my theory. It looks more like there is a real monarchy in the Pridelands this way and I enjoy it. This is stunning inn just how vibrant and detailed this piece is. I'm actually really glad that your interpretation of an older Zuri is that she's grown more mature and considerate as she's grown. Just the way this is presented is an utter joy to see. I love their titles! It's nice to see other parts of leadership other than king and queen. This piece is so beautiful! I love the perspective!